The Nexus 7 tablet from Google comes with a limited amount of internal storage and, at least on the surface of it, limited peripheral-handling capabilities (but see my earlier blog on the subject of the CloudFTP device and using that to enable the Nexus to access hard drives wirelessly). I was hesitant to write about this subject before thoroughly testing it – and this is not for people who’ve never painted their own car, but I can confirm from experience that it IS practical, for free, to enable your Nexus 7 to not only use external USB memory or hard drives, but also to work with external SD memory. Right now I’m listening to music sitting on a 16gig external SD card plugged into my Nexus 7. Here’s how. 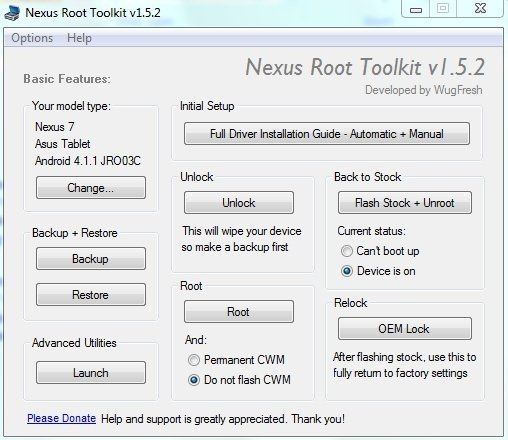 Firstly you need to ROOT the Nexus 7 using the Wugfresh Toolkit which is entirely free. Essentially this means you are enabling super-user access so that certain programs can gain more in-depth access to the hardware. In my case this did not work straight out of the box – and this is the hardest part of the job, though “hard” is overstating it a bit. You see you need a driver on your PC to work with the Nexus 7 + toolkit and my 64-bit Intel laptop just was not having the automatic install. I won’t bore you with the details but I followed the instructions in the toolkit and within minutes had a working driver. All of this, incidentally, in theory invalidates your warranty incidentally but it is reversible. The next step was to backup all of my programs using the toolkit– I was really worried about this but it turns out that was misguided. I lost only a few settings for email which were readily restored manually. I also had to reload the maps of my Satnav program – again hardly a problem. And with that, I performed the next steps of unlocking and rooting the Nexus 7 (2 button presses). After a reboot I ended up with a Nexus 7 capable of “root” or super-user actions. In English, I could now load from the Play Store the free STICKMOUNT program. That done I was well on the way to accessing external devices on the Nexus. You can’t use any old USB lead – you need a HOST adaptor – look it up on Ebay, they cost a couple of pounds. They are a micro-usb-to female-usb adaptor with a special configuration (a normally unconnected pin on the micro-usb side is grounded), you’ll know you have the right one as you can plug a mouse or keyboard into it and it’ll work with the Nexus (after a reboot in my case). So now you can plug in the lead, plug in a USB memory stick – or USB adaptor to SD memory card – and you have full access to the data on the stick/card – so much for restrictions. If you want to use a memory stick AND a keyboard, you’ll need a POWERED USB hub as the Nexus doesn’t put out enough power to handle multiple devices – don’t be tempted to plug in a cheap un-powered one. Job done – it works perfectly. For sub-£200 this machine is a no-brainer…worth every penny. I could see these devices appearing everywhere – of course – Apple must be aware of this – but they don’t let you access external memory and that, for some is an issue. The Nexus 7 as you can see has no such issue.